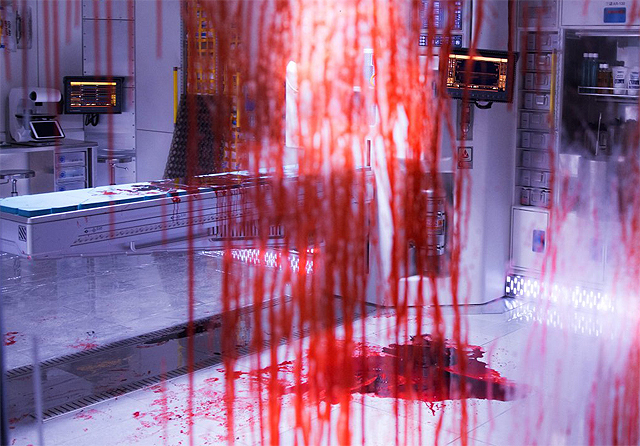 20th Century Fox has released a new Alien: Covenant photo featuring the aftermath of some bloody med-lab mayhem, along with a new cryptic number “224612072104,” which adds up to 31. Check out the full Alien: Covenant photo in the gallery below, along with the previously-released photos from the last few days! Michael Fassbender (reprising his Prometheus role of David as well as a new android Walter) stars in the film along with Katherine Waterston (Inherent Vice), Danny McBride (Eastbound & Down), Demián Bichir (The Hateful Eight), Jussie Smolett (Empire), Amy Seimetz (Upstream Color), Carmen Ejogo (Selma), Callie Hernandez (Machete Kills), and Billy Crudup (Watchmen). Noomi Rapace is also expected to reprise her role as Dr. Elizabeth Shaw, and James Franco is said to play the Captain of the title ship. Jack Paglen (Transcendence) and Michael Green (Green Lantern) are providing the Alien: Covenant screenplay, which Ridley Scott once again directs. Alien: Covenant will burst into theaters on May 19, 2017.